As you all know, I can't resist a neutral home, so when I saw this one I had to stop and admire! Herma's home is at once elegant and cozy, a sensibility achieved through the mixing of beautiful European reproduction pieces and contemporary furniture from places like Ikea. My favorite piece in the room? The Alice and Wonderland-inspired loveseat with that fantastic highback and its oversized quality. I also love the unexpected use of a pedestal table for placing drinks instead of the predictable coffee table. There's much to love about this kitchen -- the flood of light, the stone and wood floors, the tumbled-marble countertops, the glassfront cabinetry -- but my favorite part has to be those three little stools! Against the sleek island, their curvaceousness stands out beautifully! Mixing the colors was also a brilliant way to create more interest and depth to the space. A beautiful wood table, carved and distressed mixed with steamlined chairs is the perfect marriage of the ornate and simple, speaking to the larger aesthetic of the home. Always elegant, forever comfortable. one of my good friendss Aunt's had a couch like that top one shown - i always thought it was sooooo awesome - almost like in a children's book or something - ..
thanks for sharing the love, miss crystal. Elegant and cozy perfectly sums up this lovely abode! That first pic with the couch is amazing! Love it! The mixed stools are amazing! Brilliant. 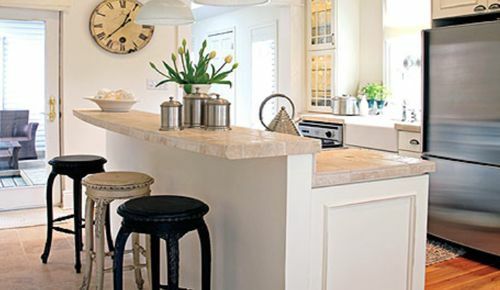 I'm in love with that kitchen - it's divine! Love, love these images. Great mix. Just found your blog via La Dolce Vita. Glad I did.